This particular review appeared on 1998, since then Celtic Accent has gone on to refine and upgrade the show with the 78th Fraser Highlanders. There was indeed another review a few months later, which I will attempt to also put up on the past articles. However, the problems with this particular Chicago performance are similar to most problems experienced when Highland tries to "tread the boards!" "Celtic Accent" or the Highland version of the "Magnificent Seven" comprised of seven World (SOBHD) Highland Dance Champions. 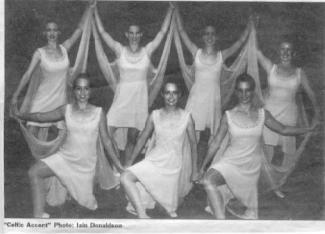 Anne Milne Armstrong, Natalie Ann Hall, Carleigh Leighton, Colleen Rintamaki, Natalie Quick, Jacqueline Smith, Dawn Brennan, were the featured dancers for the 78th Fraser Highlanders production of "In Celtic Times". As with any new production, producers take their show on the road to test its reception, work out any problems, find out what works and what doesn't. "In Celtic Times" followed the time-honored tradition and took their production to Chicago. If the audience's reaction was anything to go by the 78th Fraser Highlanders have a hit on their hands. Audiences are intelligent, and this particular audience was more knowledgeable than most. The audience made up of numerous pipe band members, Scottish societies and many Highland dance studios. They paid to see some of the world's best dancers and musicians, and they were not disappointed. Anne Milne's choreography was exciting, encompassing the best of Highland with ballet and modern dance. She managed to show the power and grace of Highland and the talents of the various champions of the troupe. Unfortunately, as with any new production, there were some irritating problems. Lighting and staging left a lot to be desired. The very poor lighting design left dancers in the dark on more than one occasion and detracted from the overall performances. Cue to Cue and entrances needed the help of a professional stage manager. However this is why productions "go on the road" to sort out these problems. "In Celtic Times" is a work in progress and progress it will! The 78th Frasers certainly lived up to their reputation of World Champion, they included in their repertoire music considered outside the pipe band norm. The bands very innovative piece, "Drummer's Suite"- the Westray Miners was clearly one of the audience's favorites. The suite begins with the "Louisbourg Discovery" (discovery of coal seams in 1673 on Cape Breton Island), continuing with "Dust in the Air", "Room and Pillar"(mining technique which left large sections of coal to form pillars) "St Barbara" (Patron Saint of miners), "Draegermen's Banquet (banquet held in the honor of the rescue efforts) and culminating with "the Coal Train" and the pulsating feet of the Irish Dancers. The Irish dancers were also champions in their own right and count among their number 4 Canadian Champions and 2 participants in World Championships. "A Flame of Wrath for Squinting Patrick", the blood curdling legend that inspired this tune was the burning of a village and the consequent death of many of the inhabitants by Donald Mor MacCrimmon to avenge the death of his brother known as "Squinting Patrick". "Squinting Patrick was brought to life and to the present day by the choreography of Anne Milne and the highland dancers. Unfortunately this was one of those times when lighting was a problem, but the dancers managed to convey the drama and poignancy of the piece never the less. "Celtic Accent" and "in Celtic Times" will continue to refine this production. March 2001. As stated previously Celtic Accent and the 78th Frasers did in the next performance I reviewed acquire the services of a stage manager. Unfortunately even with that particular production there were some "logistic problems" problems faced. I mention this, as these are very common to Highland performances. It is unusual for any Highland performance whether Pipe Bands or dancing to stay very long in one performance arena. They do not have the luxury of weeks of performance in one place. They are in fact a "truck and bus" show. This has it's own particular problems. For instance, the next arena that I saw the "In Celtic Times" performance was a "three sided performance area" almost theatre in the round. The choreography was staged for proscenium, as were the entrances and exits. Wings and curtains were unavailable and the lighting had to then be adjusted from the "lighting plot" designed by the shows Tech Director. Problems that intensify when you arrive late in the evening on a Friday for the Saturday show. Which means catch-up and a lot of hard work for the crew and performers. The problems faced by most Highland Shows can be alleviated with a "professional" stage manager and tech director familiar with "truck and bus" performances. The other suggestion is for the producers of the show to decide, " Are they a concert performance or a theatrical production". These are tow different animals and unfortunately most highland shows that I have reviewed can't seem to make up their mind, therefore they are neither one thing nor the other. If Highland performances wish to appeal to non-Highland audiences they have to Be as creative in their thinking as well as in their music and dancing.